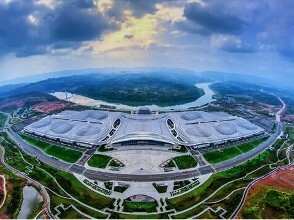 The Second Western China International Fair for Investment and Trade (Western China Fair) will be held in Chongqing International Expo Center from May 16th to 19th, 2019. As an international exhibition approved by the the State Council, it is an important platform for regional and international economic cooperation and exchanges in China. The Western China Fair will focus on industries and investment along the "Belt and Road" and the provinces and cities, the advanced technology, products and equipment of multinational companies, state-owned enterprises and private enterprises, and exchanges and cooperation among different regions, levels and industries. The exhibition area is 110,000 square meters and divided into 8 areas, including Western China, International Exhibition, Sino-Singapore Land-Sea Logistics, Free Trade Zone, Regional Exhibition, Multinational Exhibition, State-owned enterprises, and Private Enterprises. There will be over20 economic events, including the Opening ceremonies, Inland open Summits, Signing of major projects etc. Chongqing has provided great opportunities as the strategic center for the western China, Belt and Road Initiative, the Yangtze River economic zone, China-Singapore (Chongqing) Connectivity Initiative, Land-Sea New Channel, China (Chongqing) Free Trade Pilot Area, National Cross-Border E-commerce Pilot Area, National Service Trade Innovation Pilot Area, National Big Data Pilot Area, etc. Organizers: Ministry of Commerce, Ministry of Water Resources, the State Council, China Federation of Overseas Chinese, China Council for the Promotion of Trade, Chongqing Municipal Government.